Store in a cool dry place place away from direct heat & sunlight. Refrigerate after opening. 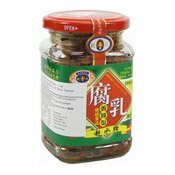 Ingredients: Soybean, Water, Peanut, Sesame, Peas, Chilli, Salt, Sichuan Pepper, Artificial Chicken Flavouring (0.5%), White Wine, Flavour Enhancer (E621), Firming Agent (E511).